Welp. We’ve done it, Charlottesville. We’ve created The Perfect Saturday Morning. The equation? 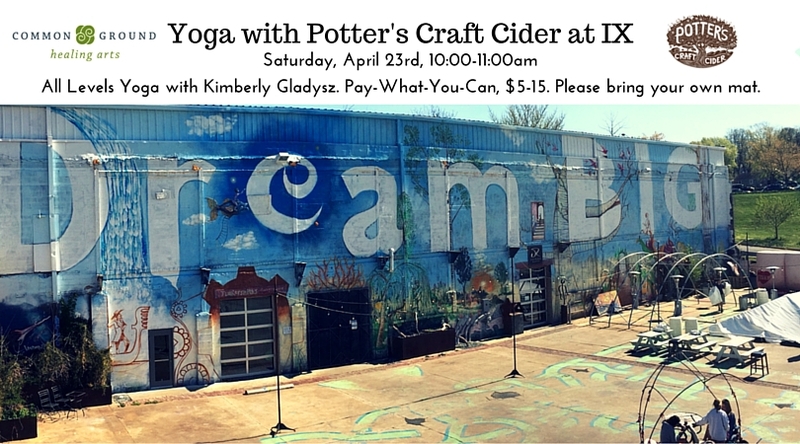 Coffee at Shark Mountain + breakfast tacos at Brazos + yoga with Common Ground + a Potter’s Craft Cider mimosa = !!!!!!! Come do the math for yourself this Saturday, April 23rd from 10:00-11:00am. The yoga class will be beginner-friendly and a good fit for experienced students who enjoy a thoughtful, meditative pace. Kimberly Gladysz is known for her positivity, genuine warmth, and enlivening flow classes. This class is offered on a Pay-What-You-Can basis from $5-15. Please bring your own mat. If you’d like to pay in advance, you can sign-up and pay from here. $5-15 cash, check or card on Saturday will also work. Potter’s Craft Cider Farmer’s Market After Party beings at 11:00am with tastings & cider mimosas. Can it just stay spring forever? When Kimberly was 5 years old, she wore a hula skirt everyday for a month. Her love for dance and the waves continues. She loves the way yoga helps her to enjoy life more from the inside out. As a yogini, she has been practicing for the past 18 years with a strong and fluid foundation in ashtanga yoga with Richard Freeman, and has been teaching gentle vinyasa flow. As a mindful leadership coach, she presents stress management for resiliency programs for organizational development and wellbeing. She currently presents at the Federal Executive Institute and at corporate retreats Kimberly loves her time with her friends, watching sunsets, and laughing. You may see her work at www.leadingmindsatwork.com andwww.livemusicyoga.com.